Phew, 2 days until my first exam. So you know that feeling when you’re literally 99% ready for an exam and you just don’t want to study anymore? Okay – well maybe not 99%, but you know what I mean. Also, I have 12 days between my first and second exam. If that’s not the universe trying to screw with my holidays and life, then I don’t know what is. I mean, at least I kinda enjoy the courses I’m taking this semester so it’s not making me want to claw my eyes out like last year when I had to go through organic chemistry… now that was a nightmare. I remember a few nights where I would literally sit on my room’s floor and think about all the creative ways I could set fire, or dramatically destroy my textbook and course notes after my exam to seek revenge on the pain the course had put me through. Hopefully anger towards a pile of paper isn’t a flag sign of some mental disease forming inside my weird head… yikes. Anyways, yesterday morning, I went out to do a grocery haul at my favourite market and I managed to get 4 bunches of radishes for $1. Yeah, that’s right, 4 big bunches. I’ve been munching on them raw, throwing them into my salads, but pickling them has been my favourite so far. It just takes that slight bitter edge off of the radishes and imparts this beautiful, tangy zing that just brightens up everything. You basically just throw a few sliced up radishes into a jar with vinegar, oil, and some spices and seasonings like a bayleaf, coriander, fennel, and some garlic. A few hours later you’ll have a beautiful pickle! That aside, nothing can really replace the crunch of a fresh radish. I know, I know, I just did a recipe with radishes like 2 posts ago but they’re pretty and if you don’t like it, then away with you! 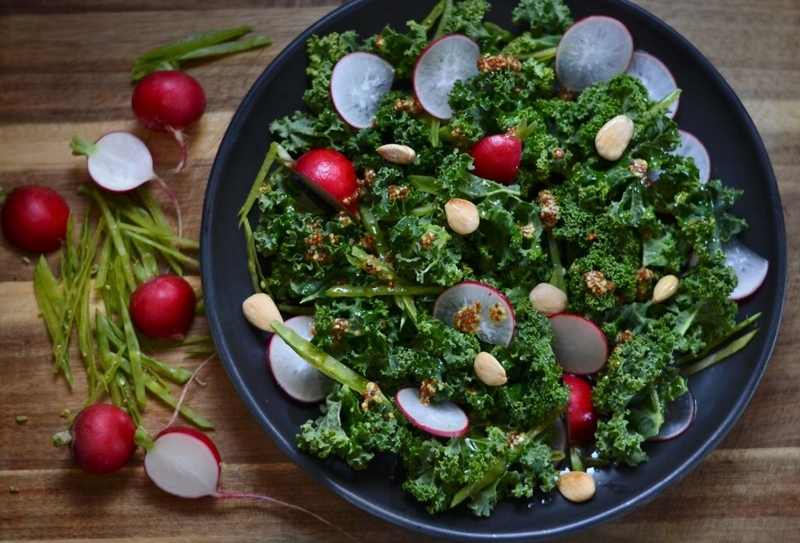 Paired with the meaty, iron-y, chew of curly leafed kale and the sweet crunch of snow peas makes this the perfect combination. Also, if you weren’t aware, you really have to massage kale when you eat it raw. It helps with your digestion so it doesn’t like… scratch your insides while it makes its way out of your body. So you know, just pretend you’re a masseuse for a few minutes whenever you’re eating raw kale and just massage the heck outta those pretty leaves. Better digestion = better absorption of nutrients! Lets get into it, shall we? 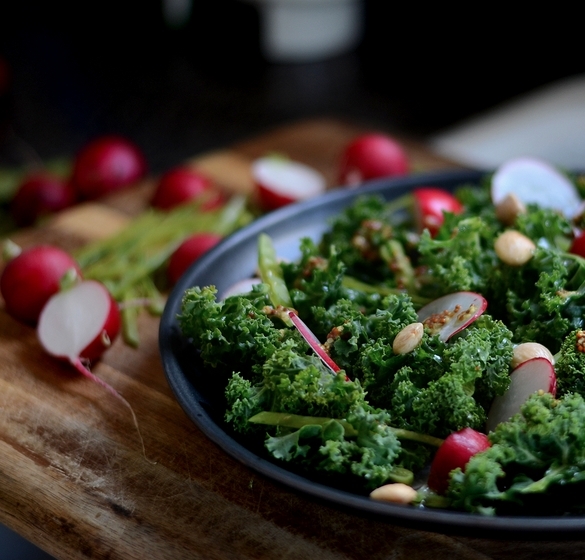 – 1 bunch of curly leafed kale, about 4-5 cups? 2. 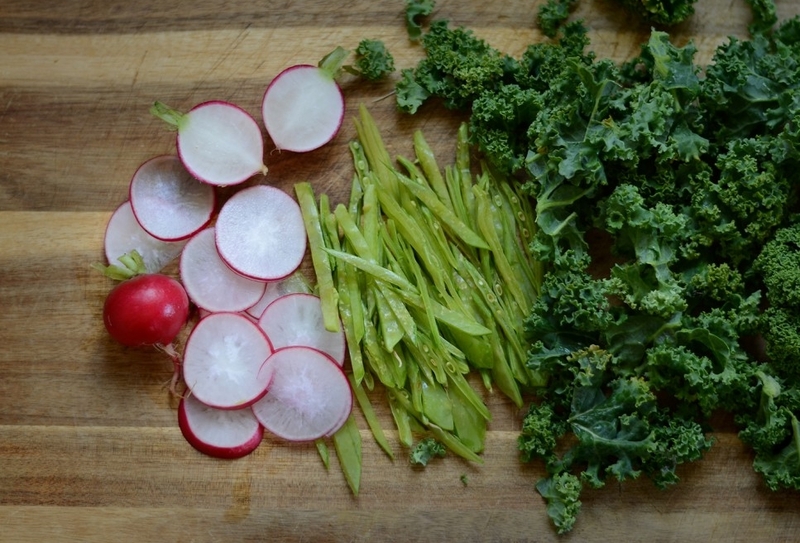 Slice your radishes and snow peas into thin slices and strips respectively. 4. Toss the salad ingredients with almonds. 5. Let it sit for about 5-10 minutes before eating!